Behavioral dynamics: Are you nudging or segmenting? RevolutionCredit’s products provide two benefits: segmenting consumers based on credit risk and nudging consumers toward better payment performance and financial health. From the outside, it may not be clear which benefit is in effect. In this post, we discuss the differences between nudging and segmenting. A nudge, as we will use the term, is any aspect of the choice architecture that alters people’s behavior in a predictable way without forbidding any options or significantly changing their economic incentives. This is key: “alter people’s behavior.” A nudge causes people to make a different decision than they may have prior to a given intervention. Every day, we see that people who complete one of our modules do exhibit different behavior from those who choose not to. Is that a nudge? Yes, sometimes it is. Sometimes, it’s a case of segmentation. While these outcomes differ, both are useful depending on the circumstances. RevolutionCredit invites customers to participate in a financial health module. After participants successfully complete a module, we track their financial behavior (e.g., on-time payments, credit usage). 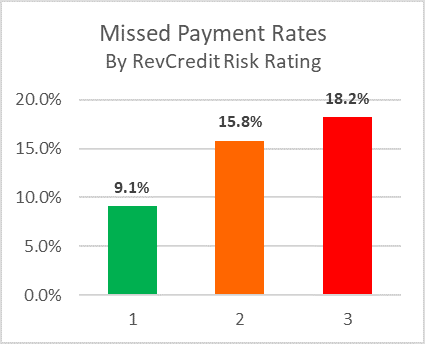 Typically, the behavior of the RevCredit completers differs from those who do not complete RevCredit. But does that actually represent altered behavior? Or does it only identifying those who act differently, something not revealed in credit reports or Big Data models? Let’s describe each of those in a bit more detail. The essential basis of analysis in any experiment is having both test and control groups. The test group gets the intervention to see what changes. The control receives no intervention and continues on a business-as-usual basis. The test group includes both RevCredit completers graduates and non-completers. When reviewing outcome differences between test and control groups, a nudge shows a statistically valid difference in the two groups. Generally, a nudge represents performance that would not otherwise have occurred. One consideration in that analysis: are there sufficient RevCredit completions such that the nudge will be able to show a statistically valid difference? There are cases where RevCredit completers and non-completers are statistically differentiated from one another on a given outcome, but in aggregate test group results are the same as the control group. This is segmentation, where RevCredit successfully segmented consumers in a way that credit reports or big data models do not. Another key difference between nudging and segmenting is the duration of the observed effect. 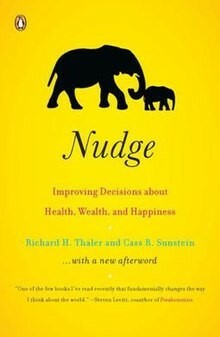 Go back to the definition of nudge that Thaler and Sunstein use. Nudges occur in the context of a “choice architecture.” They are situational, occurring as someone considers options. After the choice is made, nudges’ impact fades without implementation of automated performance management tools. Life continues apace, and other influences affect daily routines. If automated tools are not available, nudges require regular, ongoing exposure to cause behavioral changes over a longer period. Segmentation concerns the more fundamental traits of a consumer. These traits may include those that led the individual to complete RevCredit when offered. The consumer’s subsequent actions reflect these same traits. They are not based on any choice architecture; and, because they are fundamental to the individual, they last longer without the need for further reminders. Nudges are temporary changes in mindset that lead an individual to make a different choice than they would under other circumstances. This incredible power of nudges in the context of financial health helps steer people in a positive direction toward the achievement of their financial goals. Segmentation is determined by the availability of new information about an individual formerly unavailable through other sources. The act of completing RevolutionCredit can be the key basis of segmentation, or data gleaned from the module completion can be used for segmentation. One of our clients implemented BackOnTrack (BOT), RevolutionCredit’s engagement platform for delinquent customers (collections). Completers are consumers who choose to (1) complete BOT, and (2) get their account current. Voluntary completion of BOT establishes a momentary change in conditions, as customers focus on their delinquent balances, the impact on their financial goals and aspirations, and how to resolve their delinquency. In the well-developed realm of collections, such a meaningful pickup in performance is valuable. The difference in cure rates (accounts who get current) is strongly statistically validated, which demonstrates that the intervention qualifies as a nudge. Another RevolutionCredit client, a non-prime online installment loan provider, uses the ExtraCredit platform in making decisions whether to approve loan applicants who are initially declined on traditional credit underwriting. If the applicant were to be declined, he or she is offered the chance to complete RevCredit ExtraCredit to possibly receive a change in decision. The basis for the potential change of the decline decision is the data collected on the applicant after he or she completes ExtraCredit. To kick off the program, the client approved a significant number of customers who completed ExtraCredit with an average loan amount of $3,500. The client did this knowing they’d incur losses, but they wanted to collect statistically valid data to analyze correlations to performance. Separately, we developed a scorecard to predict delinquencies using performance data for 15,000 ExtraCredit course graduates, utilizing behavioral signals generated through completions. The scorecard successfully segments 5,695 customers from a separate validation population (p-value = 0.0003). This scorecard was applied to the applicants whom our client approved. All of these customers completed ExtraCredit, so no nudge advantage would accrue to any one of them in particular. Rather, these customers are segmented based on the behavioral signals they generate. And with those signals, a meaningful percentage of marginally declined applicants can be approved profitably. Both nudging and segmenting are powerful tools in the behavioral toolbox. Nudges have rightfully received much attention (e.g., Nobel Prize). Segmentation is a valuable behavioral tool as well. If you plan to leverage behavioral principles in your business, then consider how you and your customers will benefit from using either nudging or segmenting. Hutch Carpenter oversees data analytics, the development of behavioral measures and the application of RevolutionCredit data to achieve significantly better outcomes for clients. Please complete the form below to download the white paper. The Whitepaper will download automatically. If you run into any issues please click here to try again. Otherwise, you may close this window and continue learning more about RevolutionCredit.